Out today from Shout! Factory is another spectacular Action Double Feature finally bringing two long lost classics to DVD for the first time. Being the huge fan of 70s action films I am, this release was a must have for me. Starring the likes of Jason Miller (The Exorcist), Richard Harris (Orca...yes, I picked Orca out of his illustrious career), Edmond O'Brien (The Wild Bunch), Linda Haynes (Rolling Thunder), Bradford Dillman (Piranha) and Chuck Connors (Tourist Trap...yes, I picked Tourist Trap out of his illustrious career), I was sure I wouldn't be disappointed with these two films, which frankly I had never even heard of before this release was announced. The first film in this set is The Nickel Ride, which stars Jason Miller as Cooper, a mobster who has been in charge of the same block of town for many years. Friendly with all of his neighbors, he soon becomes paranoid that he is out for "a hit" after a few of his deals fall through. His boss assures him that he is safe and that his new driver (Bo Hopkins), a loud mouth cowboy is there to assist him, but he can't help feel that something is askew. Cooper takes his girlfriend (Linda Haynes) out to the country to let things cool down, but the worst is yet to come. The other film in the set is the oddly titled 99 and 44/100% Dead! Starring Richard Harris as an aging hit man named Harry Crown (looking eerily similar to Michael Caine in his Harry Palmer films), he is hired by crime boss Uncle Frank (Edmond O'Brien in his last role) to kill rival kingpin Big Eddie (Bradford Dillman). He is assisted by his jealous girlfriend Buffy (Ann Turkel) and young protege Tony (David Hall) but when Buffy is kidapped, the job becomes personal. Out to get Harry is the dangerous assassin Klaw Zuckerman (Chuck Connors), who has a personal vendetta of his own. I just can't get enough of Shout! Factory's Action Double Features. After the Dirty Mary, Crazy Larry and Race with the Devil set and the Fighting Mad and Moving Violation two-fer, I didn't think it could get any better - but I was wrong. The Nickel Ride and 99 and 44/100% are both quirky, unconventional mobster films that exemplify why the action genre in the 70s was so great. Though similar in theme, The Nickel Ride and 99 and 44/100% could not be more different. The Nickel Ride is a dark, low key, character driven drama that has surprisingly little action - though when it does, it delivers. Miller and Haynes are great as the troubled couple, unsure of what the future will bring. Bo Hopkins turns in a great performance too as the eccentric Turner and would easily steal the show if it weren't for Miller's complex portrayal of Cooper. I can't help but compare The Nickel Ride to one of my favorite films, The Friends of Eddie Coyle, for its focus on the characters more than the action. Like Mitchum's role as Eddie Coyle, Miller's brooding Cooper is a classic example of a tragic hero who knows his days are numbered. 99 and 44/100% Dead! is a more quirky and off beat affair, though no less entertaining. At first I was unsure if the film was a spoof or not, with its strange introduction and Henry Mancini theme song. As the film gets going though, the tone definitely becomes more serious. There are some nice shoot outs, stand offs and an amazingly dangerous looking car chase, not surprising considering director John Frankenheimer's filmography. Harris pulls off the role of Harry Crown quite well, blending a perfect mix of coolness and danger. Connors as the appropriately named Klaw is also a highlight of the film. 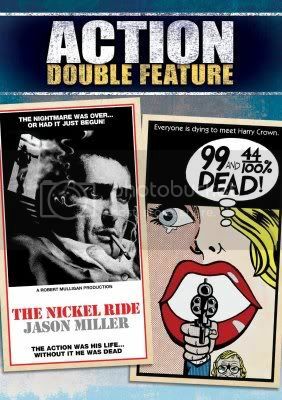 In closing, for fans of 70s action films that don't follow all of the boring, derivative formulas, you can't go wrong with The Nickel Ride and 99 and 44/100% Dead! This double feature also includes trailers for both films and the widescreen transfers are crisp and virtually pristine. Offered up at a low retail price, this set is too good to pass up.